What does 400 tons of pure glass look like? At the Nelson-Atkins Museum of Art this month, you can find out—thanks to a new maze designed and built by the artist Robert Morris using 968,902 pounds of one-inch-thick glass. 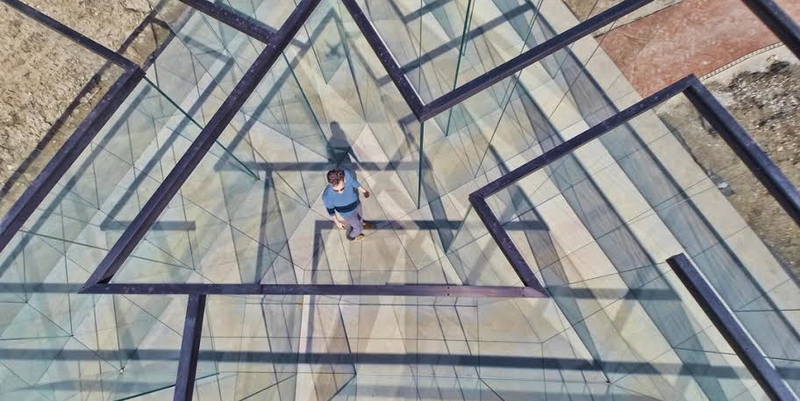 Last week, the Kansas City museum completed work on Morris' Glass Labyrinth, which took two months to build thanks to its fragile, weighty design. From above, the maze is shaped like a triangle, terminating in an arrow at the center. But from afar, it looks like an optical phenomenon—if not not for the steel plate that runs along the upper edge of the seven-foot-tall glass plates, it would seem downright ghostly. Getting to the use of glass in constructing labyrinths did not come all at once. After making labyrinths of wood, marble and granite, I wanted to open them up and used stainless steel fencing for one built in Korea. Glass seemed like a next step. Images: John Lamberton/courtesy of Nelson-Atkins.